Deimatic displays are a type of anti-predator behaviour that startles the predator. They have received much recent theoretical attention, enabling the empirical study of this phenomenon within a predictive framework. It has long been known that bluetongue skinks (Tiliqua spp. ), when approached by predators, open their mouth widely and expose a conspicuously coloured tongue. Here, we test whether such ‘full-tongue’ displays are triggered by an imminent predatory attack in the Northern Bluetongue skink Tiliqua scincoides intermedia and examine whether this display behaviour is consistent with the predictions from deimatic display theory. First, we demonstrate that luminance at the rear of the tongue, which is only exposed during full-tongue displays, is almost twice as high for lizard and bird receivers compared to the tip of the tongue, and that tongue colouration is generally more conspicuous to a bird than a lizard visual system. 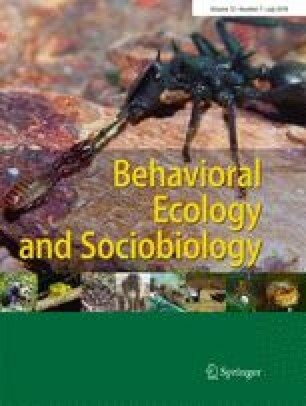 Second, staged predatory encounters using model predators reveal that lizards primarily exhibit full-tongue displays in the final stages of a predatory attack. Lizards performed full-tongue displays congruent with the predictions associated with deimatic displays, i.e. rapid exposure of conspicuous elements from a previously inconspicuous state concurrently with aggressive defensive behaviour, most frequently during the final stages of a predatory encounter. Surprisingly, we also found that lizards vary the area of the tongue exposed during chemoexploratory tongue-flicks depending on whether a predator is present or absent. Bluetongue skinks have long been known to expose their large blue tongue in response to predatory threats. However, this behaviour has never been investigated empirically. Here, we use Northern Bluetongue skinks (Tiliqua scincoides intermedia) to test whether this behaviour is consistent with predictions associated with deimatic displays. We show that the rear of their tongue is UV-blue and more conspicuous to predators compared to the tip and that this ‘full-tongue display’ is only triggered in the final stages of a predatory attack. Arnaud Badiane, Pau Carazo and Martin J. Whiting contributed equally to this work. We are grateful to Grant Napier for his invaluable field assistance, Sarah Pryke for loaning us a reflectance spectrophotometer, and Bill Stewart and Corrin Everitt for making their property available for our study. We also thank two anonymous reviewers for improving this manuscript. MJW and PC conceived the study. SJPR, PC, and MJW conducted the experiments and collected the morphological and colour measurements. AB scored the behaviours. MFB took the tongue measurements. AB and PC carried out the statistical analyses. AB, PC, and MJW drafted the manuscript, and all authors provided feedback. This work was supported by funding to MJW from Macquarie University. AB was funded by an iMQRES doctoral scholarship awarded by Macquarie University (2014166), and PC was funded by an Endeavour fellowship. For the handling of animals, we followed the ABS (Animal Behavior Society)/ASAB (Association for the Study of Animal Behaviour) ‘Guidelines for the treatment of animals in behavioural research and teaching’. Our research protocols were approved by the Macquarie University Animal Ethics Committee and University of Sydney Animal Care and Ethics Committee, Parks and Wildlife Commission of the Northern Territory, and the Western Australian Department of Environment and Conservation.